Huskies football received good news Sunday when RB Myles Gaskin, the No. 2 career rusher in UW history, said he will skip the NFL and return for his senior season. In a move fairly unusual for players with NFL-caliber talent, RB Myles Gaskin said he is planning to come back for his senior season with his University of Washington teammates. Ahead of Monday’s deadline for declaring intent for the NFL, Gaskin told the Seattle Times Sunday he had unfinished business. “The University of Washington has always been really good to me and there is no reason to just run out as soon as I can,” Gaskin said. “I feel like I left some meat on bone, leaving with a loss (in the Fiesta Bowl), and I don’t want to go out like that. Gaskin said the NFL draft advisory board gave him a fourth-round grade. He would have a chance to improve that standing with a strong senior season. Gaskin needs only 51 yards to break Napoleon Kaufman’s UW career rushing record of 4,106 yards. His 98 yards in the Fiesta Bowl moved him past Chris Polk into second place. 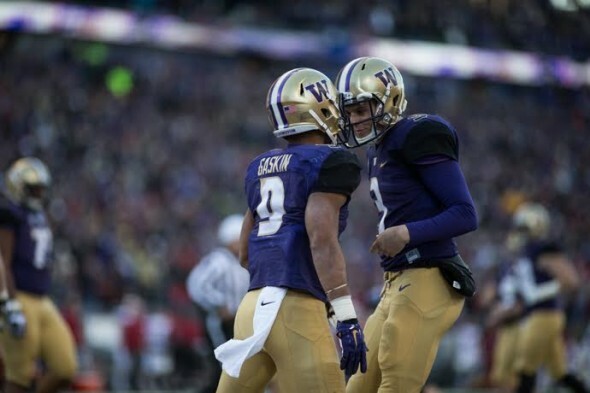 Gaskin rejoins QB Jake Browning, who also was draft-eligible, to extend the most productive tandem in UW history. Gaskin has a school-record 49 total touchdowns, including four receptions, and Browning has 78 TD passes, both school records. Also returning on offense are both tackles, Trey Adams and Kaleb McGary, and on defense, DT Greg Gaines and SS Jojo McIntosh. Amid assurances he is a first-round pick, junior Vita Vea has declared for the draft. The Huskies figure to be favored to win the Pac-12 North when they open the season in Atlanta Sept. 1 against Auburn. Gaskin seems to be a solid young guy who recognizes a final season is worth the risk to prove doubters wrong about his pro potential. Great news for the Dawgs. This betters their chances to return to the College Football Playoffs. Gaskin needs to follow what Napolean Kauffman did for his last season and put on some muscle. He does that he’ll have an outstanding senior season and be guaranteed being a first round pick. Not sure Gaskin can be powerful enough to be a regular NFL back. He fits in the Polk/Sankey level of good college back who is likely to be a fringe NFL player for a few years. Which doesn’t change the fact that he is going to help make the Huskies very good next season.